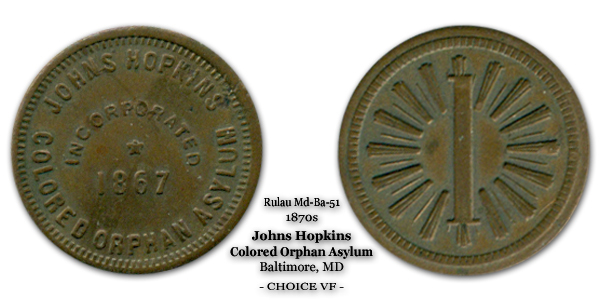 Johns Hopkins Colored Orphan Asylum 1-cent token, 1870s. Last year, the Johns Hopkins University opened the Homewood Early Learning Center on the corner of Wyman Park Drive and Remington Avenue. This temporary building offers 92 spots for the pre-K children of Johns Hopkins faculty and staff. The center isn’t the first Johns Hopkins children’s facility to grace the neighborhood. In his will, Mr. Johns Hopkins asked that provisions be made for the care of “colored orphan children” and for “destitute colored children.” His bequest also provided for the establishment of the Johns Hopkins University, Hospital, Press, and Schools of Public Health, Nursing, and Medicine. In April 1875, Johns Hopkins Hospital took over and renovated a shelter for orphans located in the 200 block of West Biddle Street. In ten years, the number of children increased from 25 to 60, and the trustees decided the facilities were inadequate. In 1894, they moved the orphan asylum to a new location at Remington Avenue and King Street (now W. 31st Street), the site of what is now the Wyman Park Medical Center. Citing the United States’ involvement in World War I, the trustees closed the school and convalescent home “temporarily” in 1917. The federal government proposed using the premises for war casualties, but it was hoped that the home would soon be reopened by the Johns Hopkins institutions to serve its original purpose. Unfortunately, this was never accomplished because the US Marine Hospital successfully sued to claim the property for its own long-term use. The current building was constructed in 1934. The home for needy African-American children never reopened, the only one of the seven institutions founded by Mr. Hopkins’ bequest to be abandoned.